Awami Markaz Islamabad fire incident is a tragedy that has caused serious damage. Awami Markaz, a six story building located in Islamabad’s red zone area caught fire taking away the life of two, on Sunday. As a result of the incident, a loss worth 250 million PKR has been recorded. Most of all, the building also had the offices of Federal Tax Ombudsman, Engineering Development Board and CPEC Center of Excellence. These companies are affected severely due to the incident occurred on Sunday. The record placed in the ombudsman’s office was also said to have been completely destroyed. [email protected], Pakistan Software Houses Association for IT and ITES has provided immediate relief for the affected companies which includes workspace, internet and hardware supplies.While free workstations are to be provided by PTCL in Islamabad. Free internet facilities to be given to the employees working from home by Nayatel. NUML has also provided free workspace for the affected offices. PCs and hardware equipment will be provided free of cost by Viper Technologies. Furthermore discounted rates are offered by PTCL internet and Nayatel will provide free installation internet for the offices being shifted. 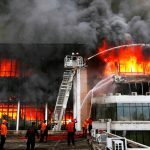 Chairman [email protected] Barkan Saeed was at the site on Sunday, said about the Awami Markaz Islamabad fire: “We are saddened to witness the devastating fire at Software Technology Park (Awami Markaz) Islamabad and of the tragic loss of life and property. Our thoughts and prayers are with the families and loved ones of the affected. We the private industry Association will do everything to ensure the business does not suffer”. In addition to the monetary loss, the incident caused the death of two people working at a call center inside the building.